Next week the Olympia City Council will talk about an ordinance that will lower impact fees for affordable housing. More specifically, the ordinance will lower impact fees for "housing with a monthly housing expense that is no greater than 30 percent of 80 percent of the median family income." The idea is that since developers make the most money building high-end housing for people that can afford it, this will create an incentive to build less expensive housing for those who can't. But in the short term, I think we should pull back and take a look at impact fees in general and what kind of housing this ordinance is likely to encourage. First though, let's say that impact fees are a one time fee for initial impacts that a new house will have on Olympia. Things like new roads, new parks, new schools are paid for out of these fees. But, long-term maintenance of these public assets come out of property taxes that end up being paid on the value of each home. So, while the initial burden of new homes can be blunted by impact fees, long term maintenance is everyone's problem. And, that is when we get into choosing what kind of housing we choose to build. Up until very recently, most of Olympia was locked into single family home only zoning. Now, more neighborhoods are open for what is called Missing Middle housing types, like duplexes, townhomes, etc. And, a lot of people are connecting this impact fee proposal to the Missing Middle proposal. Larry Dzieza's post on Nextdoor about the cut in impact fees is even called "Missing Middle Tax/Fee Cut for Developers." What people aren't talking about is that so-called Missing Middle development leads to higher valued properties, which leads to more taxable value for the city in the long run. Here is how that works. Generally, downtown Olympia is pretty valuable to the city and produces a lot of tax revenue (here and here). This is generally because the auto-centered suburban development style just isn't as valuable. This isn't likely anyone's favorite place in Olympia, it sits on a stretch of Jefferson that has train tracks and is just a good example of what kind of housing we used to build downtown. At at just less than 10 percent of an acre it is valued at $2,661,538.46 per acre. When you look at the map, you can see it isn't even out of the neighborhood in terms of value per acre. Let's go a few miles south on 37th Street, south of Olympia High School a block or so. This is a neighborhood of single family homes in a neighborhood with no sidewalks, and though it is walking distance to two schools and a couple of churches, isn't really what anyone would consider walkable in general. And, these four house, clocking in at just over an acre, are valued at 1,617,475.73 per acre. And, looking at this map, you see very similar values per acre among the neighbors. Another way to look at it is to think about what value is being lost to the city of Olympia by sea level rise. Downtown Olympia by 2095 (if we don't do anything) will lost about 370 acres and about $600,491,269 in total value. The land in low lying Olympia is valued at $1,631,769.75 per acre, Compared to the value of the land outside the inundation zone at $494,018.11. So, coming back to the finances of the city. In the short run, we want more walkable neighborhoods filled with affordable housing of various sizes and types. So, we want to cut impact fees to help this happen. Single family housing is more expensive to the consumer (even using the data provided by opponents of the Missing Middle). But, because high density housing uses the land more efficiently, it ends up providing more taxes to the city itself, blunting the need for impact fees anyway. I don't have a dog in this fight, but this analysis seems a little simple to me. 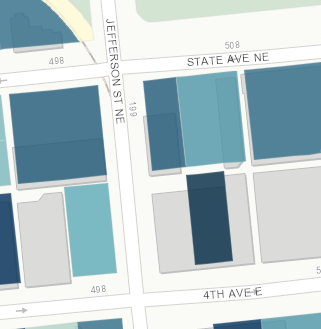 If I lived in a single family neighborhood like the one in your map, and somebody put a four-plex up next to my house, I'd expect the market value of my house, and of the houses on the block (and the City's tax revenue from them) to go down. Emmett, that's an interesting analysis. You've shared anecdotal evidence; have there been any studies done that confirm your argument? I would ask the same question of Thad's assumption. In general, I've sensed a polarized, white/black dynamic to the missing middle policy debate. For example, given Olympia's steadily increasing property values, is it realistic to argue that the value of a home would decrease -- as opposed to rising more slowly than a comparable house elsewhere? I also wonder to what degree the property value question is an implementation issue. 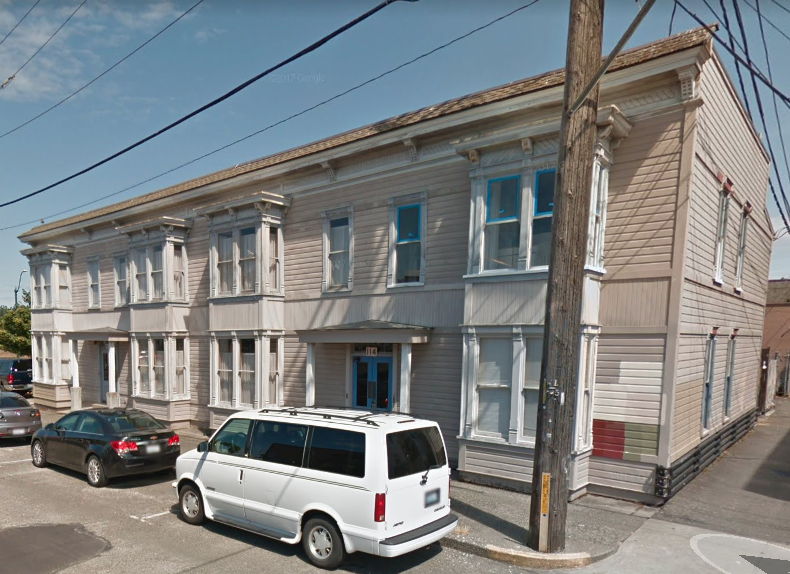 In other words, carefully sited and well-designed duplexes or townhouses could plausibly impact a neighborhood very differently than ones that are poorly planned.